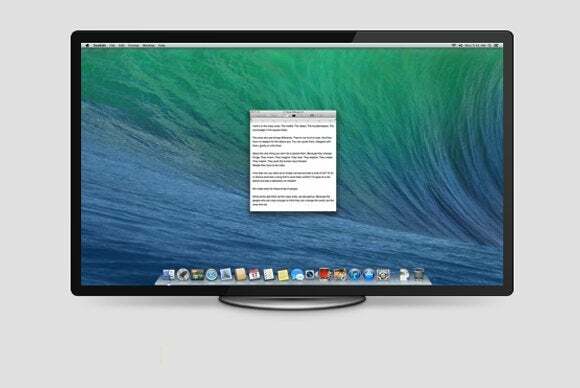 The new 10.9.3 update to Mavericks offers improved support for 4K displays. Before the update, Retina MacBook Pros and the new Mac Pro were able to drive 4K displays, but using any resolutions below the monitor’s native resolution would result in soft, slightly blurry-looking screen elements and jaggy text. The new resolution options and system optimizations in 10.9.3 make scaled resolutions look much, much better. Previously, when you connected a late 2013 Mac Pro to a 4K display (like the Sharp PN-K321 that we have in the lab) via Mini DisplayPort, you’d see two options in the Display system preferences: Best for Display, and Scaled. Best for display is the 4K display’s native resolution, 3840 by 2160 pixels. Everything looks sharp, but text, icons, and other screen elements appear very small. 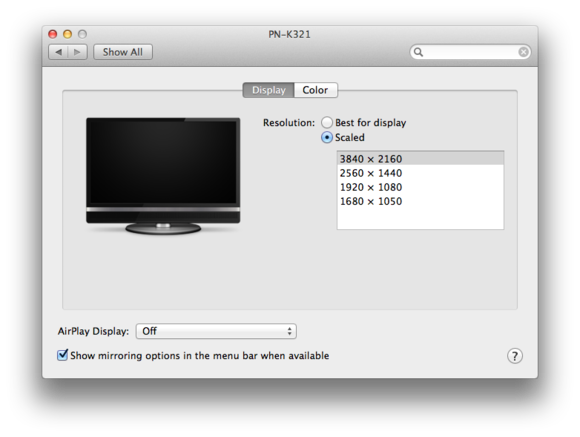 OS X 10.9.2's Displays system preference had limited 4k monitor support. That first selection is the same native resolution as Best for Display. Icons are very small, but text and all elements look sharp. The next selection is 2560 x 1440, the same as the 27-inch Thunderbolt Display. Icons and screen elements are larger, but soft. The third choice is 1920 x 1080 (half of native resolution). Icons and screen elements are larger still, but not as sharp as native or 2560 x 1440. Text appears jaggy. The last choice is 1680 x 1050 pixels. This mode doesn’t fill screen, icons are still large, but elements are soft and the text jaggy. With a 4K display connected via HDMI, you had the above resolution settings and three (suboptimal) choices for refresh rates: 30Hz, 25Hz and 24Hz. The refresh rate over DisplayPort is 60Hz and you can really see the difference just watching the cursor move across the screen at slower refresh rates. The Display system preferences choices in 10.9.3 have changed. The initial choice remain the same, Best for Display or Scaled, but clicking the scaled button now reveals five icons representing the different resolutions ranging from Larger Text to More Space. 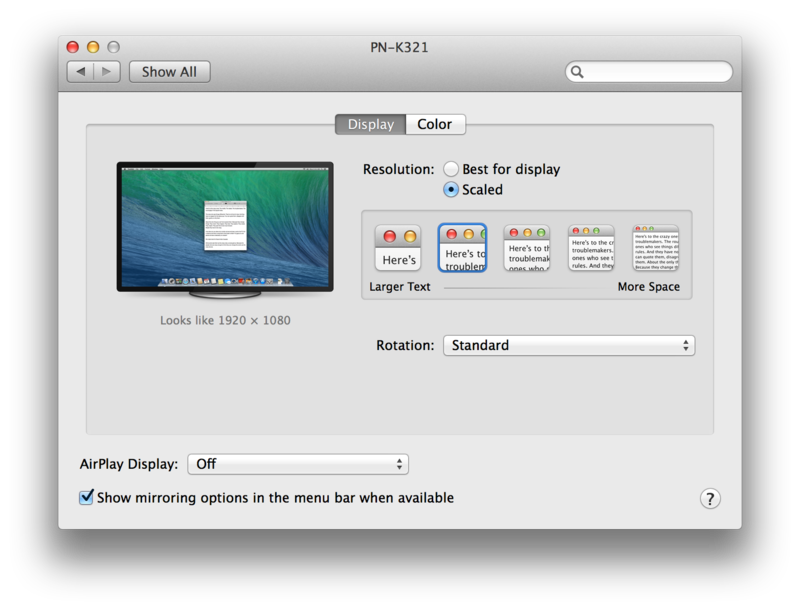 OS X 10.9.3'd Displays system preference has better support for 4k monitors. The More Space selection is the same native resolution used in Best for Display. Everything looks sharp, but screen elements are tiny. The next option is 3008 by 1692, which is new to Mavericks. This mode has a slightly stretched appearance. All of the screen elements are a bit larger, but now menus and icons look very sharp and text is much cleaner. The next choice is 2560 by 1440. Again screen elements are larger, but now menus, icons and text are all cleaner and easier to read. The next scaled resolution is 1920 by 1080—half of the native resolution. In this mode icons are larger still, but still just as sharp and clean as native resolution. The final choice is also a new resolution for Mavericks, 1504 by 846. Screen elements are similar in size to the 1920 by 1080 mode, but appears to be slightly stretched. Menus, icons and text still look very good. The HDMI refresh rate options in 10.9.2 are gone in 10.9.3 when connected to a Mac Pro. The refresh rate is automatically set to 30Hz (the previous default), but 24Hz and 25Hz are no longer options. Again, you can notice the effect of this lower refresh rate when moving the cursor and windows around onscreen. Retina MacBook Pros continue to support 4K displays, but only over HDMI and at the lower refresh rates.